When Joko Widodo was confirmed as Indonesia’s new president by the Constitutional Court late last month, there was a collective sigh of relief. Indonesians could, at least for a few years, stop worrying about a major threat to their democracy. * Not so fast. Parliament is currently discussing whipping away Indonesian’s right to elect the people who have the greatest impact on the daily lives of citizens: their mayors or district heads (walikota/bupati). The suggestion is to go back to the system in place before 2005, when district heads were appointed by the local parliament. That system was abandoned because it was so corrupt. Local parliaments are small and often stuffed with scions of large local clans whose members expect great things of their representative in government. Parliamentarians used their power of appointment not to oversee the executive, as their mandate demanded, but to wring from the district head jobs and contracts for their supporters, as well as lots of money. Some of that money flowed back to the political party that the MPs represented. Now some in the national parliament, in particular members of the parties that backed the losing presidential candidate Prabowo Subianto, want to reinstate that system. The reason they give, with no apparent tinge of irony, is that direct elections are expensive and lead to “money politics” and corruption. There’s no doubt that direct elections are highly transactional. But the transactions made and the deals done during direct elections have far more beneficieries. More important still, direct elections act as a cap on the worst types of corruption and graft. Indonesian voters are willing to accept a certain amount of distributional corruption, aka patronage; indeed they expect it. But a district head who goes too far in enriching him/herself and his/her cronies and who delivers too little to the voters will lose their seat at the next elections. Direct elections keep Indonesian politicians at least semi-honest. The old crocodiles of the party machinery — and virtually all the heads of parties backing a return to indirect elections are old crocodiles — are painfully aware that direct elections for district head also open the door to new blood. As Jakarta’s Governor-in-waiting Basuki Tjahaja Purnama (aka Ahok) observed on Monday, incoming president Jokowi would never have been elected Mayor of the small city of Solo by the party cartels in the local legislature, much less Governor of Jakarta. Ditto Ahok himself: the ethnic Chinese politician won his seat as bupati of Belitung Timur because of the his reputation as an effective manager locally, not because of his party connections. It happens that I spent Monday hanging around a district where direct elections haven’t worked so well: Sumba Barat Daya. The photos above might be taken as symbolic of what can go wrong with local democracy (I took the photo on the right three years ago, the photo on the left this week). As I sat in an outdoor canteen chatting with disillusioned bureaucrats, their new boss was being inaugurated as district head over a thousand kilometres away in Jakarta. That’s not the way things are supposed to happen. 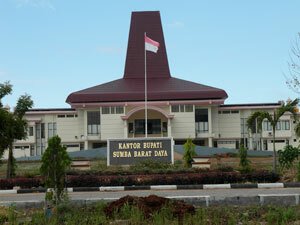 Normally, bupatis are chosen by the population and inaugurated by the local parliament. 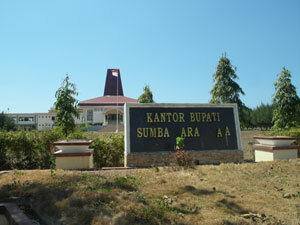 But the election in deeply tribal Sumba Barat Daya was disputed, many say stolen. The Constitutional Court, then headed by a man who has since been jailed for accepting bribes to overturn local election results, ruled against the incumbent and in favour of a candidate from a rival tribe. The hot-headed Sumbanese, who rarely leave home without a machete strapped to their waists, wrote their displeasure on their rivals in blood and flaming buildings; the rival clan reciprocated. The local parliament, still dominated by supporters of the loser, refused to inaugurate the anointed winner of the election, and the district has been without an elected head for a year. It’s worth pointing out that Sumba (along with parts of Papua) is an exception. Indonesia generally has very low levels of election-related violence. I’ve written a lot about decentralisation, for better and for worse. But now that direct local elections are under threat, I have to agree with a young friend of mine, Lia. She lives in a high-roofed bamboo house on a hill-top in West Sumba, and she turned 18 on July 9th, the day of the presidential election. “It was a really special present, to be able to participate in democracy,” she said. When I asked what she thought of indirect elections for district head, she turned fierce. “They can’t do that. It’s our right to choose our leaders. They can’t take that away from us.” To the post-Suharto generation, and that’s now a LOT of the electorate, direct elections are a given. I suspect even most older Indonesians now feel the same way; they know a great deal about the individuals who vie to run their district, who will make all the important decisions about health, education, road-building and much else, and they want to choose for themselves between the candidates. Interestingly, not one of the 20 or so people I have asked in the last two days has been able to name the member of parliament that is supposed to represent them in the national parliament in Jakarta, the very party political crocodiles who are currently plotting to remove the right to vote for district head. Perhaps a group such as Kawal Pemilu, which used a network of volunteers to defuse tension around the presidential election by providing a parallel but more rapid tally of the votes, should take on the task of letting people know how to contact their national MP. However they do it, I very much hope Indonesians make an effort to find out who their MP is, and to make their feelings about direct elections known in time to head the erosion of democracy off at the pass. *Anyone who doubts that one man can hollow out a democracy single-handedly and in a few short years, should read Masha Gessen’s The Man Without a Face, about Vladimir Putin. The principal difference between Russia’s New Dictator and Prabowo Subianto is that the former looks better shirtless on horseback. 1 Comment on "Now Indonesia’s democracy really is in danger"
btw — I really enjoy your “Indonesia Etc” book. Great job!